Incredibly sound and loads of versatility - what’s not to love? Dynamic range of fuzz tones using guitar volume. It is a matter of taste! This all-analogue silicon transistor fuzz pedal was inspired by the Fuzz Face and the problems and limitations inherent with that design (not least the necessity to always ‘see’ the guitar’s pickups at the front of the signal chain). Involving around two years of experimentation to find the perfect tone, company founder, Jamie Stillman, eventually succeeded in creating “the perfect fuzz pedal”. The inflexibility of Fuzz Faces in terms of where they normally need to be situated in the signal chain has been neatly stepped around by introducing a pickup simulation within the pedal’s circuit. The Erupter always ‘thinks’ it’s seeing a pickup’s output, which opens up more creative choices for guitarists (fuzzed flange, anyone?). The result is a highly tuned and extremely flexible little fuzz box. Equally comfortable in front of or behind any number of pedals, a special buffer within the Erupter’s circuit beefs up the signal, which in turn enables it to be cleaned up effectively on the fly. By using the guitar’s volume, rather than adjusting the pedal itself, a huge range of tones can be had at your fingertips, from completely fuzzed-out to crystal clear and everything in between. The fuzz is unmistakable: an archetypal classic fuzz sound redolent of late 60s/early 70s psychedelic hard rock. 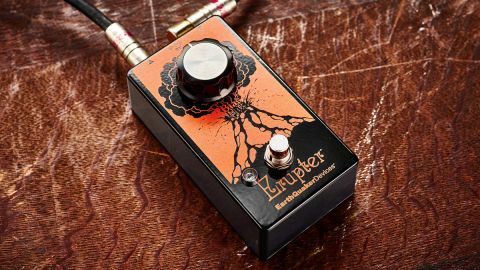 Fuzz Faces are sometimes difficult when it comes to cutting through a band mix, but the Erupter manages this easily without the higher-end frequencies sounding overly harsh and with distinction and clarity at the lower-end of the spectrum, even when using the pedal on full tilt. Bias, being the Erupter’s only control knob, is more of the ‘sounds usable everywhere’ kind of bias, as opposed to the extreme/gated type. It can be dialled in cooler or hotter, with a centre detent for the sweet spot (no doubt suitable for most players’ requirements). Some may question if we really need yet another Fuzz Face-style pedal on the market. However, if you’re looking for one that sounds about as good as they get, with tons more creative possibilities, then the answer is a resounding yes!